The forecast called for southerlies from Friday to Sunday, although there were strong wind warnings for the beginning of the change on Friday morning, along with three metre swells, abating in the afternoon. After that, it looked like we were going to get a nice 15-20 knot SE or S wind which should neatly take us to Coffs Harbour, about 140 miles up the coast. We accordingly had a leisurely breakfast and spent the morning preparing the boat for sea. This can take a little time but is always a nice way of tidying up. On deck, we dismount the wind generator, reconfigure it as a tow generator, and stow away the fan blades and tail. Then we tie the oars to the dinghy, hoist it on board using a halyard, and tie it down to the fore-deck. Fit the jack-stays, if they aren’t already in place, take down and stow the sun shades, ensure that all the safety lines are secure, and clear the cockpit of clutter. Down below, all the washing up needs to be finished so that we can put away the washing-up bowls, and all loose items stowed somewhere where they won’t move in transit (never wholly successful!). All the hatches and stopcocks must be closed, and the correct charts, wet weather gear, life vests and safety harnesses fetched out. We set off a little after twelve. There was quite a bit of swell coming in through the heads and we didn’t really want to have the sails up going across the bar, so we gunned the motor and took her through. It was a bit bumpy and we left a trail of smoke, which was a bit worrying; it was the second time that I’d seen engine smoke this trip. Put that on the ‘to do’ list. Once we were clear of the bar, I went out onto the deck to attach the halyard so that we could hoist the main. This is never a pleasant chore at sea, as you get thrown around a lot and everything gets twisted. A few years back we did try attaching the main halyard early so that we could simply haul up the main from the comfort of the cockpit, but it’s a long and feisty steel cable that swings with a lot of momentum, and it really enjoys wrapping itself around everything in sight. If you leave it alone for a moment, it has a particular affinity for the light cluster half way up the forward side of the mast. Eventually with some co-ordination between deck and cockpit we disentangled it from the light cluster, put up the sails and headed out to the 50 metre line. The 3 metre swells were definitely very much still in evidence, and not very comfortable in the shallows close to shore, but they got less confused in deeper water and we set a course for the NE and gratefully turned control over to Harriet the Hydrovane. 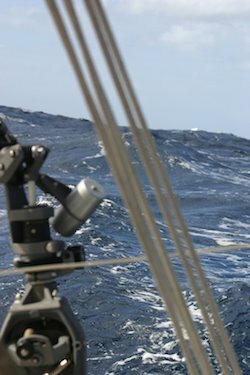 The wind was actually an easterly, so we were close-hauled and getting a fair bit of water over the deck and some in the cockpit. One made it into the galley while I was getting a drink. We put in the second reef and then, when we hit 9 knots (a new Pindimara record! ), the third one. The standard Bavaria 34 doesn’t come with a third reef, and we are always very glad that we thought of having one put in. Far from abating, wind speeds were 25-30 knots and showing no signs of changing. 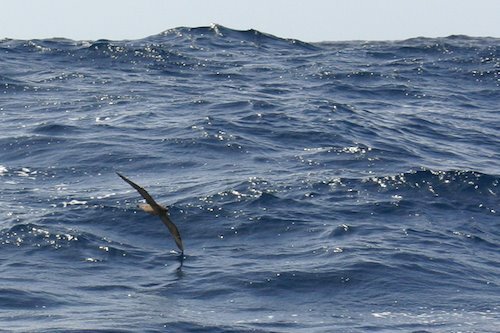 Petrels skimmed the swells around us, and dolphins showed up to say hello and to play in the bow wave. One scene will always remain in my memory. The swells had opened up, as they sometimes do, into a huge bowl-shaped depression with steep-sided waves on all sides. As Pindimara slid down one of the sides into the bowl, we realised that all the other sides were packed with dolphins, dozens of them, all surfing down into the centre with us. As afternoon turned to evening, the wind and waves remained constant. We were feeling woozy from eating sea-sickness tablets, and very grateful that Harriet could take care of the steering, which would otherwise have been very hard work. 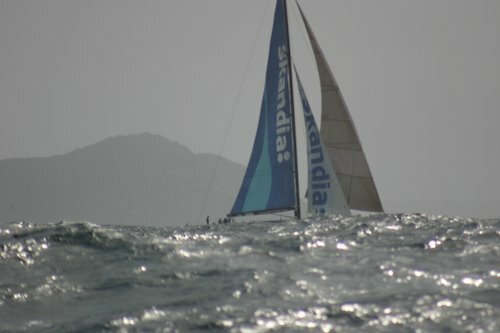 Skandia, the maxi racing yacht and oft-times winner of the Sydney to Hobart, passed us by on the port beam. The Cunard liner Queen Victoria passed on the starboard. Apart from that, it just seemed to be us and the dolphins. We shook out the third reef at dusk, because the wind had eased to 20 knots and had swung around to the SE. Maybe we were finally going to get our perfect southerly? I grabbed a couple of hours sleep, and was woken by Bronwyn shouting my name from the cockpit. Rushing out onto the deck, I found her looking at a huge bulk carrier of some kind with very odd navigation lights. We couldn’t figure out which way she was heading, but she certainly didn’t seem to be at anchor. I got out the million candlepower searchlight that we keep for these occasions, and shone it first up at our sail, and then at their bridge. After a while she turned away and we realised that she was showing all white lights at the bow and sides, with red and green navigation lights on the stern. Weird, and very disconcerting. It’s customary to have them the other way around. We were still travelling very fast, a steady 7 knots, and had cleared Seal Rocks with its associated shoals and reefs. Lightning flickered in the sky ahead, and I checked the BOM (Bureau of Meteorology) website on my phone to see if there was anything up there that we should know about. The forecast was still the same; apparently we should be sitting in 15 knots with 1 metre swells, not 25 knots with 3 metre swells. Ah well, it’s not an exact science. We put the third reef back in. I took a short video of what it’s like to be travelling in Pindimara at those speeds. Note that I had to take the video during a quiet period when I had a hand free to hold the camera. Bronwyn was feeling somewhat the worse for wear and retired to the cabin, while I kept watch under the stars. Occasionally we hit 8 knots; not bad at all for a big fat tub, but our actual speed over ground was a knot or two less because by now we were in the East Australian Current which runs down the coast hereabouts. The usual advice is to stick close to shore to avoid it, but we had cut across a bit too far and the swells made it really uncomfortable to go back inland, so we just lived with it. The night passed, and the wind finally dropped as Bronwyn came up to take the dawn watch. It was now definitely a southerly and we furled the foresail and ran on reefed main alone. We needed to get closer to shore, but crossing the line of swell was really uncomfortable and neither of us was feeling too great. We agreed to keep on as northerly a heading as we could, because the shore curves around to the north east and we would intersect with it later. The only entry in the ship’s log between 07:40 and 10:00 is “Sloppy as all hell. Going backwards?”. By ten o’clock it was clear that at 25 miles offshore we were far too deep into the East Australian Current. We were travelling at 7 knots, but only making 3 over ground. The wind was a reasonable 15 knots and the swell a mere 1 metre of nothing, but the night had taken it’s toll and we plotted a course for Port Macquarie and an overnight anchorage. Under un-reefed main alone we put the now SE swell behind us, which was much more comfortable except for the odd roller that tried to climb up into the sugar scoop. We didn’t much like the look of the description of the bar at Port Macquarie, and we’d be unlikely to be crossing it in daylight, so we looked for another option. We consulted Lucas, the definitive cruising guide for the NSW coast, and saw that he recommended an anchorage called Camden Haven, which was a bit closer and was described as having lead lights that were ‘obvious from deep water’. Lead lights are land-based markers that, when aligned, point to safe passage through a shoal or reef. As we emerged from the East Australian Current our speed over ground was picking up, and we could arrive well before sundown. We set course for Point Perpendicular beneath Brother Mountain, which was in fact already visible on the horizon, albeit twenty miles away. We arrived at the bar with plenty of time to spare before dark, but unfortunately just before low tide, so we hove to and waited for the water to get a bit deeper. While we were waiting, we cruised up and down to see if we could get the lay of the land and locate the lead lights. Obvious from deep water, my foot! We easily located the causeway on which the markers were built, but even through binoculars it was clear that the area was littered with structures of various shapes and sizes, and completely unclear which of these were the ones that we needed to line up to get our safe passage. We experimented with a few combinations, but they all seemed to either take us through the solid harbour wall or across the obvious breaking shoal. All the structures were the same colour as the background, and all were obscured by the haze of the setting sun. We went back out to sea and waited for sunset, when hopefully the “real” markers would light up blue and show us the way. Meanwhile we’d been watching the bar itself, which to our dismay was regularly obscured by huge green rollers with foaming caps. Obviously low tide was not a great time to pass. Two hours past low tide, at half past six in the evening, the setting sun went behind a cloud and we could suddenly see the correct markers, which were in fact none of the ones that we had considered earlier. This was much better than waiting for them to light up and having to navigate the channel in the dark, so we started the engine (which didn’t smoke at all. Maybe it had just been clearing its throat after weeks of inactivity) and lined them up. We’d noticed that the big rollers were coming in in twos, so we waited for two to explode over the bar and then powered ahead of the next pair. I surfed half the way on the first one, then picked up the second, dropping off the top just shy of the bar itself as the top started to curl. The wave hit the shoal just in front of us, and as it did, a whole pod of dolphins exploded out of it. They’d clearly joined us for the ride, and were going back to catch the next one. I couldn’t stop to play, though, and dropped through and into the channel, powering up to escape the next roller, and then throttling back to nothing as we came to the shallows. We were through. This entry was posted in Australia, Oceania, Travel, Voyage of Pindimara and tagged Port Stephens, Sail on 2009/03/29 by Reinhard.